Blues Legend Johnny Winter encores with “Highway 61 Revisited” @ his 70th Birthday Party Jam. B.B. 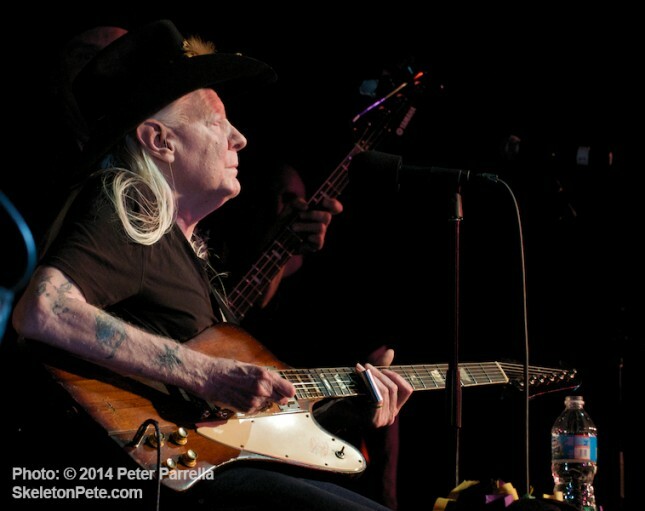 King Blues Club and Grill in New York City’s Times Square was packed to the rafters with blues music lovers and musicians on February 23, to celebrate the birthday of guitarist Johnny Winter. Winter is noted for his slide guitar work and cover songs which he invariably makes all his own. Over the last several years the Texas blues legend has played “A Season of Winter” residencies at the BB King club. Along with recording his own best selling albums, Johnny got his dream of working with Muddy Waters, producing several albums for the Blue Sky/Columbia label that are the best of Waters’ post Chess Records work. It was a labor of love and respect for the seminal blues master that landed Water’s three Grammy awards. 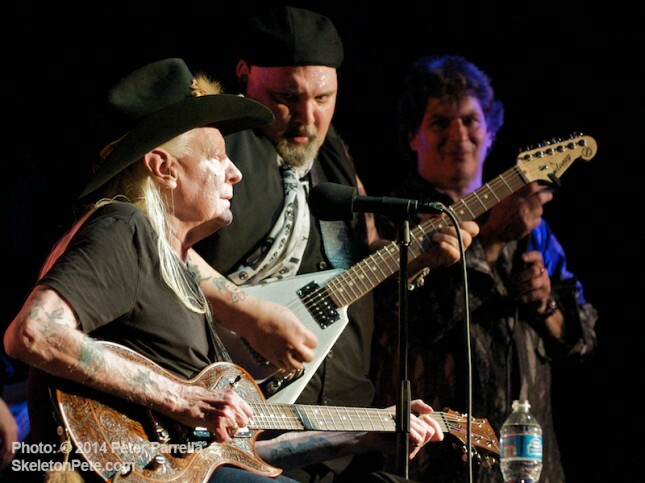 Now, at 70 years old and still playing his hard driving brand of blues rock, Winter finds his own stature – like Muddy’s – elevated to blues patriarch. A well earned and deserved recognition. Amid shouts of “ROCK N ROLL” bursting from the crowd at regular intervals (mimicking Johnny’s patented exhortation) Winter and his band turned in a set loaded with favorites. Chuck Berry’s “Johnny B. Goode,” the Rolling Stone’s “Jumpin’ Jack Flash,” Howlin Wolf’s “Killing Floor,” and “I got my Mojo Working” all got workouts augmented by a steady stream of musical admirers, like Popa Chubby, Jon Paris, Joe Lewis Walker, Debbie Davies, James Montgomery, Frank “King Bee” Latorre, and show opener Lance Lopez. Winter turned up the heat and turned out some blistering slide guitar leads, bringing wide grins to the faces of his musical compadres. Though each player is exceptional in his/her own right the gig was about homage to a master and mentor not a head-cutting session. A career spanning overview of Winter’s work, called True To The Blues, will be issued February 25, 2014 on Sony’s Legacy Recordings Label. The 4 CD box set will include, new liner notes, kudos from his peer players and two previously unreleased live tracks originally recorded at the 1970 Atlanta Pop Festival. Here’s how the company describes the package. 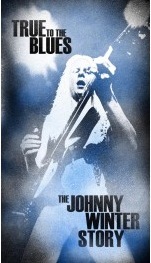 There is also a documentary film in the works called Johnny Winter:Down and Dirty. It was a great night of celebration for an iconic blues player. As usual it’s lots of fun covering a B.B. King Club show along with PiercingMetal’s Ken Pierce. I also got to chance chat about six string things with NY Luthier Joe Kaufman of JKaufman Guitars, and was glad to reconnect with Elmore Magazine photographer Arnie Goodman.